We started our day even later than yesterday but it was a good one. We were picked up by Luis, a taxi driver that Tim regularly uses, who was all set to spend the day with us. It turned out that he did a lot more that drive us around. First we set off to find a cell phone. Tim thought we should have a phone that works and he told us not to be cheap so Luis took us to a massive mall and we comparison shopped. The idea was to buy a phone outright so that we could use it elsewhere so we found a relatively inexpensive Samsung that supports two SIM cards. That way you can use it in two countries at once of can use one carrier for a better rate in some areas and another carrier for the others. It kind of makes sense to me. Phone in hand we then went to the Mercado Central, the city's central market. It is huge and it was a bit late in the day so not as crowded as it would be first thing in the morning nor was it quite a cool out. Luis walked us through, introduced us to new fruits and vegetables, procured samples of this or that so we could taste them. We had a blast and because the cupboard was bare at Tim's place we did a little shopping. First we purchase a bag for our shopping, it only makes sense to have something to carry all your food home and we wouldn't want to be wasteful. Then we started looking at the various fruits; we bought passionfruit, a pineapple, bananas, a watermelon, and a few other native fruits that we didn't recognize but wanted to try. When Francene saw the makings of a good salsa our focus shifted to tomatoes, cilantro, a native variety of avocado, onions, and peppers. With the idea of a salty savory food our palettes shifted to the other extreme and we bought coconut candy, a sugar and nut candy, fresh fruit drinks, and when we found a woman working chocolate by hand we had a sample and had to buy some of that too. It was rich and sweet with cinnamon and a heavy dose of hot pepper that gave it a nice kick. By the end we had the makings of a feast and only spent a few dollars. 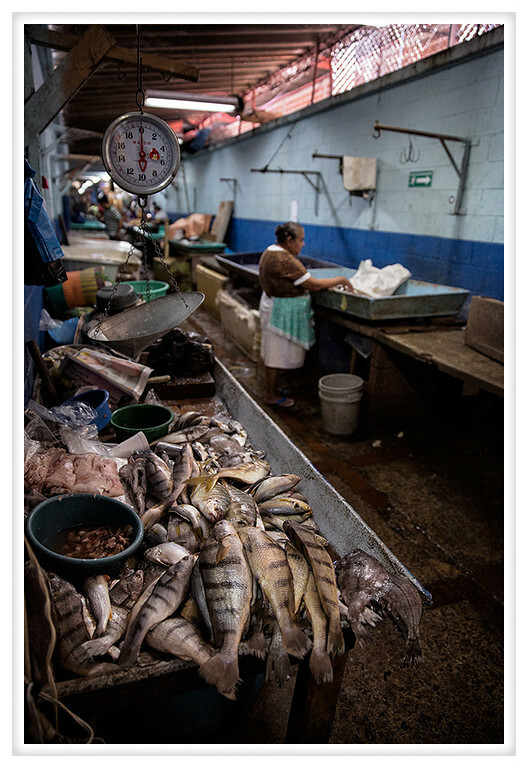 Below is a picture of a fishmonger's stall and a woman cleaning up from her day's work at the market. Even though we had been sampling all morning we skipped breakfast and were ready for lunch. When we told Luis we wanted something local he took us to Pollo Criollo, a busy little place that specializes in chicken. I didn't have the chicken, I had beans and rice with a side of pasta salad served with a couple hot tortillas. Francene had a chicken soup and Luis had a chile relleno stuffed with cheese and chicken. It all looked good and my seemingly plain lunch had a lot of great flavor. Next we presented Luis with a challenge, furniture. Tim get issued furniture by the US government since he works for them and it is the same across the globe. Literally, one company has the contract to provide furniture to employees of the US government working overseas and this place looks almost identical to his place in Cambodia. It is very traditional American style furniture and some of it is fine but the rest is kind of bad. So we asked Luis for help and he started making calls to friends and family, even to his mother, and he came up with a number of suggestions. Most were nothing amazing but one was exceptional so Francene and I started plotting... What furniture would she like to see at home in a new years? Finally we decided to return to the apartment to relax for a little bit before heading out again in the evening. Just as we were pulling up to the building the sky opened, the wind picked up, and it started to dump rain. When we got upstairs and looked out the window there was a wall of clouds advancing over the city and soon the buildings across the street were totally hidden by the clouds. Thunder rocked the city setting off car alarms and we began to wonder if maybe we were done for the day. In time the rain stopped and as the sun was setting the clouds broke a little bit but we decided that it was late and that we should just get dinner and call it a day. So we wandered the neighborhood and looked for anything that wasn't an American export. By the time we stumbled upon a Chinese restaurant we decided it would be good enough and had a light dinner.